ARRL Holiday Closings: ARRL Headquarters will be closed for the holidays on December 26 and January 2. There will be no W1AW code practice or bulletin transmissions on those days. This is the final edition of The ARRL Letter for 2016. The ARRL Letter will not publish on December 29. 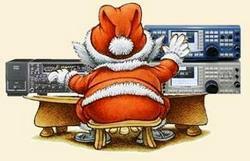 ARRL Audio News will be on holiday hiatus on December 23 and 30. We wish everyone a safe and happy holiday season! Participants in ARRL's National Parks on the Air (NPOTA) program have completed more than 1 million contacts! Activators operating from National Park Service units across the US and Chasers around the world pushed the contact tally over its goal this week. ARRL sponsored NPOTA to help the National Park Service celebrate its centennial. 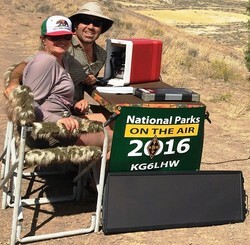 "National Parks on the Air has become one of the most popular events in the history of the League," NPOTA Administrator Sean Kutzko, KX9X, said. "It's been fun seeing so many hams take part." Anthony Wiese, KG6LHW, operates from John Day Fossil Beds National Monument in Oregon, accompanied by his wife, Aleda Cloud. Kutzko said the NPOTA Facebook group really helped drive participation, especially in the last 3 months, when it became clear that the 1 million-QSO goal was within reach. "Some 25,000 NPOTA contacts were uploaded to Logbook of The World (LoTW) every week since October," he noted. "The entire group came together and simply willed the 1 million-contact mark to be broken. It was incredible to watch!" He said some real friendships developed among those who frequented the NPOTA Facebook page. Kutzko said NPOTA garnered interest from hams at all proficiency levels, but he was especially gratified to see how it encouraged less-experienced hams to acquire new skills, such as operating a portable station on battery power, learning CW, or discovering digital modes. "Pileups from some activations rivaled those during a major DXpedition -- if only for a few hours at a time," he added. Fernando Ramirez-Ferrer, NP4JV, enjoyed the majesty of Grand Canyon National Park while handing out some NPOTA contacts via satellite. Jim Clark, Jr., an NPS Ranger at Marsh-Billings-Rockefeller National Historic Site in Vermont, said NPOTA helped to generate greater awareness of his unit. "National Parks on the Air has afforded us the opportunity to connect with a much larger and more diverse audience than we could have ever imagined," he told ARRL. "We are pleased and proud that the world of Amateur Radio helped us to celebrate 100 years of service to the nation." Kutzko said being able to blend Amateur Radio with the history and scenery offered by the National Park Service was a wonderful gift. "We heard from countless amateurs who learned something about our country while operating from an NPS unit and experiencing 'the other side' of a pileup. There will be other on-air events from ARRL, but National Parks on the Air was a once-in-a-lifetime opportunity. I don't think there will ever be anything quite like it in Amateur Radio again. I will miss it." NPOTA ends on December 31 at 2359 UTC! The digital edition of the January 2017 issue of QST is now available on the new PageSuite platform. The new viewing platform brings a number of changes, so members are advised to download and read the QST PageSuite Manual. If you view the digital edition of QST on an Apple smartphone or tablet, update your current QST app. In the App Store app, tap the Updates icon in the menu along the bottom, scroll until you see the QST app, and then tap UPDATE. This will overwrite the older app with the new PageSuite version. If you are an Android user, you will also need to update your current QST app. For both Apple and Android devices, updating to the new PageSuite app will clear your device of all previously downloaded QST issues. Finally, Kindle Fire users will be pleased to learn that there is a now a QST app for their device. Search for the QST app in the Kindle Fire app store. Important note: If prompted to enter an e-mail address upon signing into either the desktop version of Digital QST or the app, enter your ARRL website username instead. In the January issue . . . Build a high-voltage, lightweight power supply. Put a Yaesu FT-817 transceiver on 222 MHz. Add squelch delay lights to your station. Try an Arduino CW IDer. Build a motorized telescoping mast. Add software-defined radio technology to your existing transceiver. FCC Chairman Tom Wheeler has announced that he will step down in January, when President Barack Obama's term ends. An Obama appointee, Wheeler has headed the Commission for 3 years. Outgoing FCC Chairman Tom Wheeler. 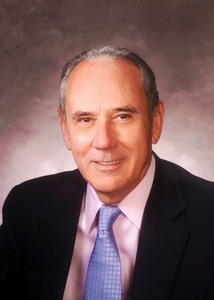 "Sitting in this chair has been the greatest privilege of my professional career," Wheeler said on December 15, during his final FCC monthly open meeting. "I'm grateful to President Obama for the opportunity to serve and for the confidence he placed in me....It has been a privilege to work with my fellow Commissioners to help protect consumers, strengthen public safety and cybersecurity, and ensure fast, fair, and open networks for all Americans." Wheeler was a staunch proponent of the FCC's net neutrality policy, which has been opposed by conservatives as government overreach. When Wheeler departs on January 20, the FCC will be left with two Republicans -- Ajit Pai and Michael O'Rielly -- and one Democrat -- Mignon Clyburn, whose term ends in mid-2017. Democratic commissioner Jessica Rosenworcel failed to gain confirmation for another term before Congress adjourned and is expected to depart by year's end. The FCC's five commissioners are appointed by the president, the political balance favoring the party holding the White House. "Antenna System Troubleshooting" is the topic of the latest (December 15) episode of the "ARRL The Doctor is In" podcast. Listen...and learn! If you've never listened to a podcast before, download our beginner's guide. Just ahead on December 29, "Restoring Old Radios." With 1 million contacts now in the log for ARRL's National Parks on the Air program, the NPOTA community has its eyes focused on a new target: 20,000 activations of NPS units. With 19,200 already in the books, NPOTA Activators will make a big push to get on the air from NPS units all across the country in a final dash to the finish line. Get in on the action as NPOTA ends with a roar on December 31! More than 80 activations are scheduled for the days remaining, including more than 20 on New Year's Eve, and the number is expected to grow. Listen for activations from Fort Matanzas National Monument in Florida, Hopewell Culture National Historical Park in Ohio, Castle Mountains National Monument in California, and Weir Farm National Historic Site in Connecticut, among many others. Don't miss your last chance to get involved with National Parks on the Air! Details about all upcoming activations are on the NPOTA activations calendar. Keep up with the latest NPOTA news on Facebook. Follow NPOTA on Twitter (@ARRL_NPOTA). 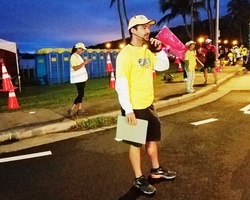 Nearly 3 dozen Amateur Radio volunteers in Hawaii were up bright and early on Sunday, December 11, to support the 44th running of the Honolulu Marathon. The fourth largest marathon in the US attracts around 30,000 participants each year. The ham volunteers communicate vital information among race organizers, aid stations, transportation vehicles, and law enforcement, as well as at the finish line. Glenn Martinez, AH6VF, was on the scene at 3:15 AM to set up at the finish line. "I participated in the 2014, 2015, and 2016 Honolulu Marathons as a ham radio operator," said volunteer Clem Jung, KH7HO. "I thought this year was the best run, and we had the most hams participating." The 35 Amateur Radio volunteers supported communication on 2 meters and 70 centimeters, and some served as operators for non-amateur digital systems. Radio amateurs provided vital communication from vans and aid stations to the medical tent, where concerns ranged from a head injury to cramps and stomach pains. Amateur Radio volunteers ensured that the aid station and medical teams were ready to treat anyone needing help. Ralph Toyama, NH6PY, handled the critical role of net control station (NCS), and the ham radio volunteers kept him apprised of medical van locations, so the NCS could dispatch them where and when needed. 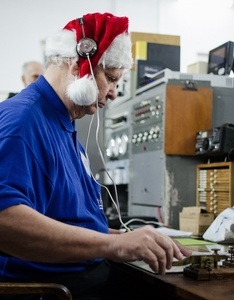 Brian Justin, WA1ZMS, of Forest, Virginia, will once again put his 600-meter experimental station on the air for a Christmas Eve commemorative transmission. The transmissions from WI2XLQ on 486 kHz will mark the 110th anniversary of Reginald Fessenden's audio broadcast on the airwaves, which may have been the first ever. Historical accounts say Fessenden played the violin -- or a recording of violin music -- and read a brief Bible verse. It's been reported that other radio experimenters and shipboard operators who heard Fessenden's broadcast were astounded to hear speech and music on their radios. 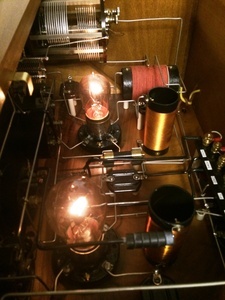 Justin will use a MOPA-design transmitter built largely with vintage parts to replicate early vacuum-tube equipment; not a Fessenden-period transmitter, it uses a UV-202 tube for the power amplifier. He will conduct a run-up to the event starting at around midday Eastern Time on Friday, December 23. The "official" event will begin on Christmas Eve, Saturday, December 24, at 0001 UTC (the evening of December 23 in US time zones) and will continue for at least 24 hours. Justin plans to repeat the commemorative transmissions on New Year's Eve and New Year's Day. For his transmitter in 1906, Fessenden used an ac alternator modulated by placing carbon microphones in series with the antenna feed line. Justin's homebuilt station is slightly more modern, based on a 1921 vacuum tube master oscillator power amplifier (MOPA) design. The transmitter also uses Heising AM modulation, developed by Raymond Heising during World War I.
Justin's WI2XLQ on-air operations coincide with dates in early radio history as a way to recognize and honor some of the earliest wireless pioneers and their achievements. Send listener reports directly to Brian Justin, WA1ZMS. The Alexander Association plans to have Alexanderson alternator transmitter SAQ on the air for its traditional Christmas Eve transmission. The 200 kW Alexanderson alternator will transmit on 17.2 kHz on the morning of Christmas Eve, December 24, with tune-up at around 0730 UTC, and the message transmission following at 0800 UTC. "Since the plant is old, there is always the risk that the transmission will be cancelled on short notice," the Association said in an announcement. Repairs following an early October fire in the long-wave antenna (attributed to arcing) had put this year's Christmas Eve transmission in jeopardy. Dating from the 1900s, the Alexanderson alternator -- essentially an ac generator run at extremely high speed -- can put out 200 kW but typically is operated at much lower power. Once providing reliable transatlantic communication, it is now a museum piece and only put on the air on special occasions. It was built in the 1920s. "Efforts are continuing toward doubling that number, and more firepower is being added to the OF9X US script," a statement said this week. "Santa will arrive on American soil, activating W1/OF9X from New Hampshire. When finally boarding his sleigh, he will say goodbye to America as W7/OF9X from Tacoma, Washington. Working Santa from these two sites adds 25 points each to the Santa Award program, to compensate for Mother Nature's poor propagation." ARRL and AMSAT -- the US managing partners of the Amateur Radio on the International Space Station (ARISS) program -- have announced that 11 schools or organizations submitting proposals have been selected to advance to the next stage of planning to host scheduled Amateur Radio contacts with ISS crew members next year. ARISS's primary goal is to engage young people in science, technology, engineering, and math (STEM) activities and raise awareness of space exploration, radio communications, and related areas of study and career possibilities. ARISS anticipates that NASA will be able to provide scheduling opportunities for these US host organizations during the second half of 2017. The 11 candidate schools/organizations must now complete an acceptable equipment plan that demonstrates their ability to execute the ham radio contact. Once their equipment plan is approved by the ARISS technical team, the final selected schools/organizations will be scheduled as their availability and flexibility match up with NASA scheduling opportunities. On December 21, Amateur Radio operators in Germany gained access to the band 5.351.5 to 5.366.5 MHz with 15 W EIRP, and a maximum bandwidth of 2.7 kHz. Access applies to Class A licensees. Amateur Radio is secondary on 60 meters. 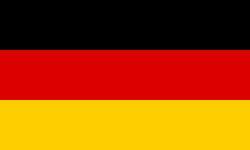 The Deutscher Amateur Radio Club (DARC) called users' attention to the IARU Region 1 band plan for 60 meters, which recommends CW and digital modes, maximum bandwidth of 200 Hz, from 5.351.5 to 5.354.0 MHz; all modes, maximum bandwidth of 2. 7 kHz (use USB for SSB), from 5.354.0 to 5.366.0 MHz, and all modes, maximum bandwidth of 20 Hz "with the least power," from 5.366.0 to 5.366.5 MHz. "Because a lot of radio amateurs must share this narrow 15 kHz band, everyone should keep transmissions short and avoid lengthy ragchews," the DARC advised in announcing access to the new allocation. Other countries are expected to grant access to the new, 15 kHz 60-meter band when the Final Acts of World Radiocommunication Conference 2015, which made the allocation available to Amateur Radio, go into effect on January 1, but the US will not be among them; the FCC has yet to allow Amateur Radio access to 60 meters beyond the five discrete channels already available. The IARU Region 1 (IARU-R1) Monitoring System newsletter reports that one of China's HF Over-the-Horizon radars (OTH-R) has been transmitting on 6.999 MHz, impinging on the very low end of the 40-meter band. Waveform of the Chinese OTH radar on 6.999 MHz, taken by Wolf Hadel, DK2OM. As the newsletter reported: "A jumping Chinese OTH radar covered the CW DX-edge of our exclusive 7 MHz band on November 17 at about 1500 UTC and later (long lasting)." The signal was 67 sweeps per second with a 10 kHz bandwidth. 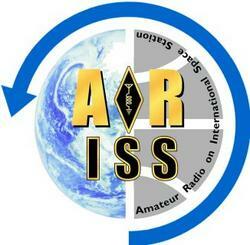 Elsewhere on 40 meters, military ALE transmissions have been heard from Kyrgyzstan on 7050.0 kHz. IARUMS also reports that the Australian Jindalee Operational Radar Network (JORN) has been heard on 10.131 MHz in the amateur 30-meter band; Amateur Radio is secondary on 30 meters. Radio Eritrea appeared in November on 7180 kHz together with white noise from Ethiopia. The frequencies 7146.5, 7175, and 7185 kHz were reported to be still in use as well. Reports of Amateur Radio band intruders may be logged on the IARU Region 1 Monitoring System logger. 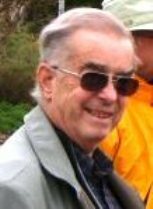 Past AMSAT-NA President Frank Robert "Robin" Haighton, VE3FRH, of Burlington, Ontario, died on December 2, after suffering a stroke in late November. A Life Member of Radio Amateurs of Canada and a member of ARRL, he was 79. Haighton served as AMSAT-NA president from 2000 until 2004, succeeding Keith Baker, KB1SF. Prior to that, he was an AMSAT executive vice president and a longtime member of the Board of Directors. As a founding member of the Amateur Radio on the International Space Station (ARISS) project, he was one of two delegates from Canada. "Robin contributed significantly to ARISS through his ideas, guidance, and wise counsel," said AMSAT Vice President for Human Spaceflight and ARISS-International Chair Frank Bauer, KA3HDO. "He challenged members of our team to look at things in a different perspective. As a result of his sage advice, we were able to work through these issues and arrive at a common approach, both in developing and delivering ARISS hardware as well as supporting the technical mentoring of schools and local hams." Ring in the New Year with Straight Key Night: Every day is a good day to operate on CW, but set some time aside on New Year's Eve and Day to enjoy Straight Key Night (SKN). The annual event begins at 0000 UTC on January 1, 2017 (New Year's Eve in US time zones). The 24-hour event is not a contest, but a day dedicated to celebrating Amateur Radio's CW heritage. 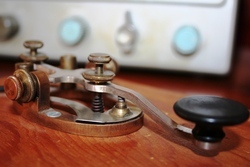 Participants are encouraged to get on the air and simply enjoy conversational CW contacts, preferably using a straight (hand) key or a semi-automatic key (bug). Activity traditionally centers on CW segments in the HF bands. There are no points or obligatory exchange. The only requirement is to have fun! Send a SKN list of stations worked and your vote for "Best Fist" and "Most Interesting QSO" by January 31. AMSAT CW Activity Day is January 1 (UTC): AMSAT CW Activity Day -- formerly Satellite Straight Key Night -- will take place on January 1, 2017 (UTC) and run for 24 hours. As with the old Straight Key Night, this is a fun event, not a contest, and there is no required exchange. All forms of CW are welcome, from straight keys, bugs, and keyers to keyboards and decoders. Working the same station on more than one satellite is permitted. All participants are asked to post their results, including any "Soapbox" comments, to AMSAT-BB. Include the satellites you used and the number of CW contacts you made on each. Participants may post their full logs, although this is not required. WSJT Development Group Releases WSJT-X Version 1.7.0: The WSJT Development Group has released WSJT-X version 1.7.0. The WSJT-X software suite is designed to facilitate basic Amateur Radio communication using very weak signals (WSJT stands for Weak Signal communication by K1JT). Joe Taylor, K1JT, recommends reading the extensively updated WSJT-X version 1.7 User Guide, which describes new features and capabilities (relative to version 1.6). WSJT-X version 1.7.0 includes new modes ISCAT, MSK144, and QRA64; newly implemented submodes JT65B-C and JT9B-H; a new Franke-Taylor decoder to replace the Koetter-Vardy decoder previously used for JT65; improvements to the JT4, JT9, and JT65 decoders; multi-pass decoding for JT65 and WSPR, and improved convenience features for EME Doppler tracking. KH6LC Planning Multi-Multi Kids Day on Saturday, January 7: Lloyd Cabral, KH6LC, reports he plans to have his station on the air for Kids Day as a multi-multi on 20, 15, and -- if it opens -- 10 meters. He is anticipating a half-dozen young visitors to his Keaau, Hawaii, home. 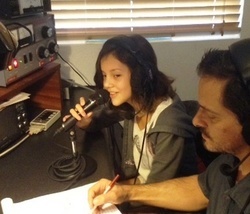 Kids Day begins on Saturday, January 7, at 1800 UTC and concludes at 2359 UTC. "We'll be spotting ourselves on DX Summit," Cabral said. "I'm not sure who has more fun, the kids operating or the adults 'coaching' them. We must be on to something good because everyone wants to come back year after year. Please consider inviting some young people in to operate." Sponsored by the Boring (Oregon) Amateur Radio Club, this event has a simple exchange, suitable for younger operators: first name, age, location, and favorite color. Details are on the ARRL website. Tad Cook, K7RA, Seattle, reports: On December 22 at 0002 UTC, the Australian Space Forecast Centre forecast enhanced geomagnetic activity until December 24, with minor storms likely and some major storm periods possible. December 15-21 solar activity was little changed from the previous 7 days, although no sunspots were visible on December 16 and 17. Average daily sunspot numbers declined from 13 to 11, and average daily solar flux bumped up 1 point to 73.2. Average planetary A index dipped from 13.3 to 7.9, and average mid-latitude A index from 9 to 5.7. 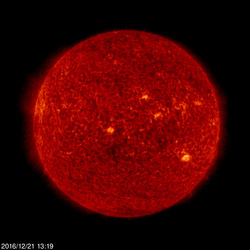 The outlook shows daily solar flux at 75 and 80 on December 22-23; 85 on December 24-28; 75 on December 29; 77 on December 30-31; 79 on January 1-3; 77 on January 4-5; 75 on January 6-10; 77 on January 11-12; 75 on January 13-14; 73 on January 15-17; 75 on January 18-23; 77 on January 24-27, and 79 on January 28-30. Predicted planetary A index is 30 on December 22; 12 on December 23-24; 8 on December 25; 5 on December 26-January 1; 8, 10, 20, 22, 16, 14, and 6 on January 2-8; 5 on January 9-13; 10 on January 14; 15 on January 15-16; 25 and 28 on January 17-18; 12 on January 19-20; 8 on January 21, and 5 on January 22-28. Sunspot numbers for December 15 through 21 were 12, 0, 0, 13, 12, 25, and 15, with a mean of 11. The 10.7 centimeter flux was 72.5, 72.6, 72.1, 72.3, 72.8, 74.9, and 75, with a mean of 73.2. Estimated planetary A indices were 3, 3, 6, 9, 5, 6, and 23, with a mean of 7.9. Estimated mid-latitude A indices were 2, 2, 3, 6, 5, 4, and 18, with a mean of 5.7.